Colts win, but do they still top the alternative rankings? Published: Dec. 20, 2011 at 11:34 a.m. Seriously, Chris Johnson. You were tackled by two Colts. That's not good. It's Tuesday on NFL.com, and that means it's time for the power rankings. But here at Pick Six, we see things a little differently. While everybody's debating who should be called the NFL's best, let's not ignore the NFL's worst. Those are the teams we will be talking about once the draft draws closer. The Colts shook up things this week by beating the Titans, but was that enough to kick them out of the top spot? Oakland was No. 6 last week, but they should have defeated Detroit and escaped this list. But the Raiders are doing really, really bad. They're doing things that never would have happened if Al Davis was still around, not in the least is that trade for Carson Palmer. But fake punts and other shenanigans have kept this team from already claiming an AFC West title. Everybody wants to say the Colts will be in a position similar to the Packers when they had Aaron Rodgers backing Brett Favre. And I think the Colts are like the Packers. But the 1989 Packers, who inexplicable won a game they should have lost, thus ruining their chance to grab Troy Aikman. (And who knows how the football world would be different if that happened?) But don't worry Colts fans; you should be just as good as the 1989 Packers, who still landed a good player in Tony Mandrich. Oh, right. Raheem Morris returning for another season in Tampa Bay would be about as surprising as Kim Kardashian turning down an interview with one of those supermarket tabloids. And accordingly, the Bucs have followed their coach's lead by folding up their tents. Well, not Ronde Barber, but most of them. However, fantasy owners would like to thank the Bucs for allowing the Cowboys' stars to score all of those points Saturday night. Coach Leslie Frazier took a big risk playing Adrian Peterson this week. But even then, the star running back wasn't enough to keep the Vikings close to the Saints. Minnesota appears locked into the No. 3 spot for the rest of the season. St. Louis still has an outside chance at the No. 1 spot in the draft, and it's playing not to win right now. Just a perfect effort from St. Louis in pursuit of the top overall spot, which is what it truly wants. I mean, that's why the team brought in Josh McDaniels, right? To run a highly confusing offense to make sure it can't win. I would hate to believe this team actually was trying. That would be sad. So sad, I won't even make the gratuitous Albert Pujols joke. For all of you Titans fans upset about your No. 1 ranking, two things: First, you lost to the Colts. Second, you lost to the (expletive) Colts. And what's worse, the Titans remain in line for a real playoff spot, but they're playing like a team fighting for draft seeding. 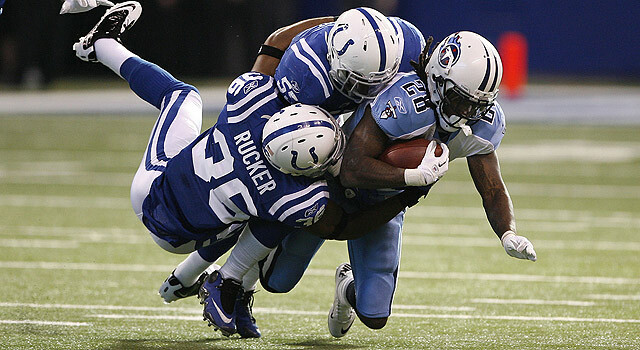 Jake Locker gave Tennessee the best chance of winning, and he started the game on the bench, so Matt Hasselbeck and his endless checkdowns could become Indianapolis' first victims of 2011. Sorry Titans, you've earned this. "Six grievances that need airing..."